More than £32 million of noodles are set to be destroyed following safety concerns that they contain unsafe levels of lead. 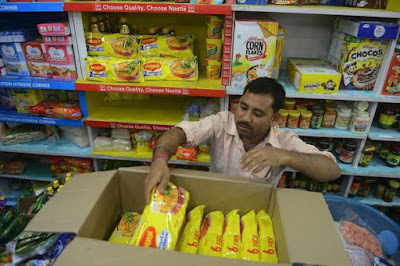 The Maggi noodles, one of Nestle's massively popular foods, have been targeted by India's food safety regulator, the Food Safety and Standards Authority of India (FSSAI). According to the Times of India, tests have found that the noodles are "unsafe and hazardous". They also stated in a ruling on June 5 that the Nestle product hasn't stood up to food safety laws, an accusation the company has denied. They say that the noodles are safe, and have mounted a challenge against the ban. It's a massive blow to the world's biggest food company's business in India, where they cover 80 per cent of the country's noodle market. The value of withdrawn Maggi noodles was estimated by Nestle to be around £32.3 million. In a statement, Nestle said: "There will be additional costs to take into account, for example bringing stock from the market, transporting the stock to the destruction points, destruction cost, etc. "The final figure will have to be confirmed at a later date." Nestle have been withdrawing Maggi products from stores for a number of weeks following the FSSAI's report that there were levels of lead in the products that were considered unsafe.